KODIAK Fiberglass Rebar / CR-GFRP (Corrosion Resistant Glass Fiber Reinforced Polymer) - Made with Premium Corrosion Resistant E-CR glass, Kodiak FRP is the best concrete reinforcement for any application, especially those where concrete is exposed to water, salt water, or chemical environments. 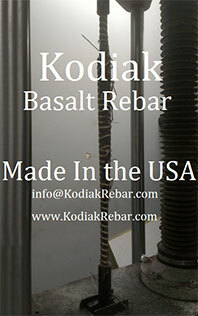 Kodiak rebar does not corrode, weaken or dis-color. 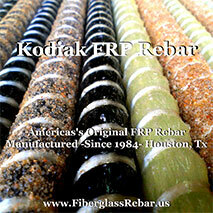 Kodiak Fiberglass Rebar is 25% the weight of steel rebar with twice the tensile strength of steel rebar. GFRP rebar is Non-magnetic, Non-Conductive to electrical current & thermal transfer, & transparent to (RF) radio frequency. These characteristic qualities have made GFRP Rebar standard protocol for use in MRI facilities, power transmission terminals, precision calibration, toll-roads as well as any area in which magnetic equipment & radio frequency is present. GFRP rebar is the concrete reinforcement of reputable pre-cast concrete manufacturers for quality production. The most critical cost consideration in comparing Fiberglass rebar vs Steel rebar is the weight per lineal foot is substantially lower & tensile strength properties are higher. GFRP rebar has more than 300% greater linear footage per ton when compared to steel rebar. Fiberglass rebar cost comparison should also factor: tensile strength is more than 200% of its steel counterpart. Using Advanced Materials in Infrastructure Design is the Key to Building Green... Sustainable Building ! Using Advanced materials in design is the key to building green...Sustainable Building! There is not a legitimate argument in the facts. 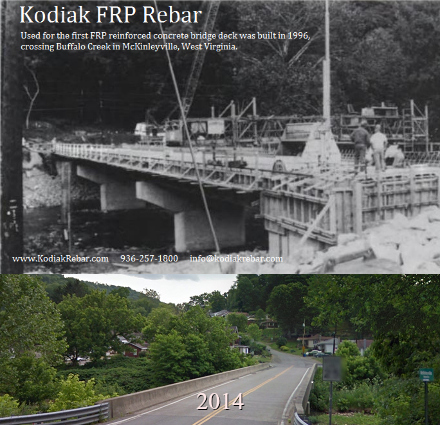 Infrastructure development using Kodiak FRP rebar is the most economical option. Anything less is short sighted cost analysis projection. Ignoring service life cost projection is a display of defiance to fiscal logic, an adolescent or lazy mentality that we just can not afford as a society in progress. Kodiak GFRP reinforcement initial cost is fractionally higher on front end budget calculation. With that said... Analyzation of cost to service life savings when accounted, convert to an astronomical fiscal return on program investment. Too often, critical working life cost analysis is dismissed or minimized by carelessly short sighted budget politics over-ruling or ignoring the best interests of the peoples national infrastructure longevity & sustainability. Save a buck today & kick the can, spend 5 times as much next time to demolish & rebuilt again, and Again &... Again. Its is just tax revenue, free money right? Wrong... Now is the time for responsible planning. Its time to scrutinize service life projections critical to long term value engineering with use of high quality, efficient materials for the infrastructure of our country, our home. The Carbon footprint of steel in production is much higher than that of FRP rebar production, even without consideration of the footprint left by demolition & rehabilitation time & time again. Not to mention the carbon offset provided in the ability to use less concrete in the initial structure by a thoroughly strategized engineering design.